Hills. When I started, I was young. I bagged Munros, scaled crags, ran screes, denied Death ... saw God and heard wolves. When I was young. Now I am old. The last 10 years has seen a hatch, an infestation of walking clubs, rambling clubs, strolling clubs. No Munros, no crags, no screes, fair weather and safe in the middle pack. When I started, I was young. When they started, they were old. So now we are both old - alors - but I don't have to like it. I do not like reminiscing with them about that lovely day we had on Keeper Hill or the fkn bluebells in Tullybrannigan wood. 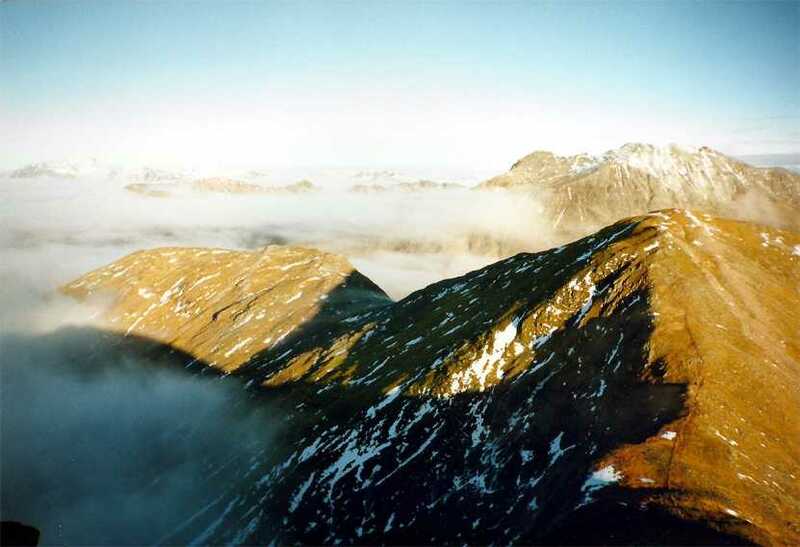 I'd rather be recalling how Kenny had to be lifted off the Aonach Eagach or when Roisin got caught in that rockfall or how Alan and I ran up and off Tinto in 45 minutes which was long before the bleeding knee brigade was born. But the most disappointing thing, something 'way beyond my own indignation, is there are no colts and fillies like Kenny or Roisin or Alan on the hill today. Not the real thing. So when I saw them float in from beneath Thomas's, like ghosts, I swear I saw halos. Eyes like foxes'. Limbs elastic. Not a sag in the stretch pants and not one grey hair. Ascending that miserable bog like they were in a space ship. I suppose more than 20 of them and every one travelling at a pace that startled me. "Come up through the falls?" he asked me. Not a new-club-old-man question. 6 words and straight into talk of the Mournes Seven Sevens. "Any of you do it this year?" I asked. Eight. Bldy eight of them! One of them liked it so much he just did it again a few days later. This is the Northern Ireland Young Walkers Club. You can get them on the interweb. They are the real thing and I am so pleased to have met them, seen them in action and most importantly to know they are there. I pulled away from them, not on some flea infested tourist trail but above the Black Stairs crag which is a comfortable distance from pipes, slippers and cardigans.